After years of stunning V-twin sportsbikes, Ducati pulled off a masterstroke giving their top-of-the-range superbike a V4. It’s genius – the perfect way to move on a V-twin concept that had reached the end of its development path while still allowing the bike the soul it needs. There is no doubting that this is a step forward from Bologna and they’ve made the most desirable sportsbike on the planet, with amazing, light handling, superb power delivery and the kind of top-end rush that skews your senses and tests your sheer ability to hold on. It’s the real deal. 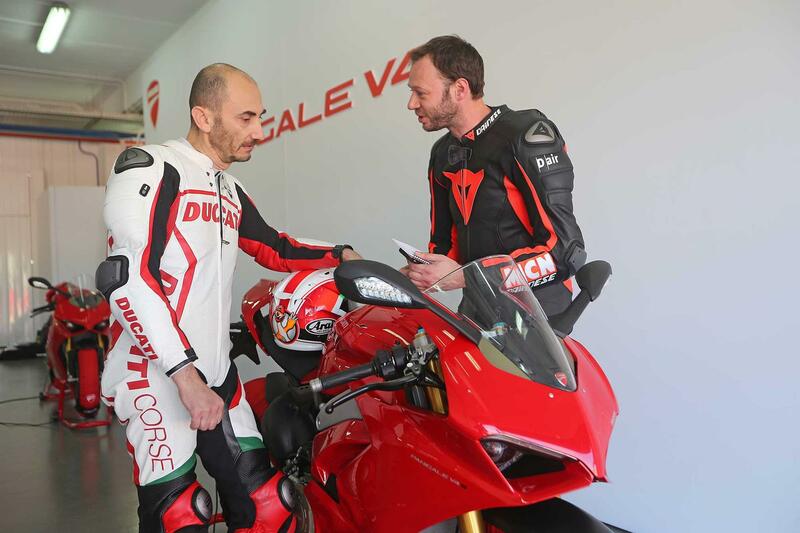 With 211bhp, a new MotoGP-style frame and some of the most advanced electronics in the world, Ducati’s V4 Panigale replaced the 1299 Panigale in Ducati’s superbike line-up and forms the basis of their 2019 WSB challenger. The bike is simply astounding. Ducati said at its launch that it was the fastest, most powerful production bike that the world had ever seen and after that first session we had no reason to doubt them. The engine makes power in the kind of glorious, linear way that makes it easy to exploit, but once it gets revving it simply takes your breath away. It’s got loads of soul and goes through gears so fast it blows your mind. Despite being a V4 it still sounds and feels like a Ducati but it’s all we can do to hold on! The chassis is impressive too. Just like their MotoGP bike, Ducati have given the V4 a reverse-rotating crank, which means that it rotates in the opposite way to the wheels to counteract their gyroscopic forces. It means the bike is nimble and easy to steer. The electronics are some of the most advanced on the planet and on the conservative settings we’re running at the moment, allow you open the throttle with impunity, but without ever feeling like you’re being restricted. It's a great bike for all levels of trackday riders, but pretty civilised on the road as well. There is so much to learn with a huge amount of different settings, modes and electronic interventions, but it’s pretty obvious that the mechanical side of things is bang-on. It’s proper. 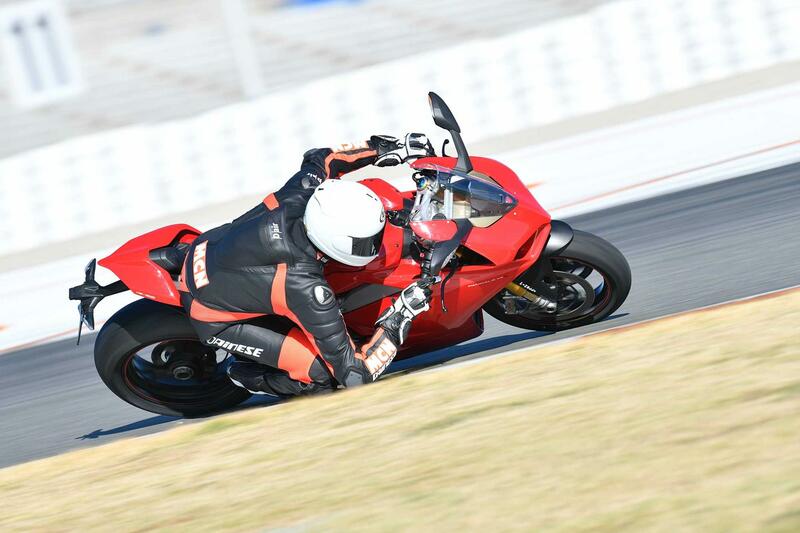 How fast is a Ducati Panigale V4 S? The two-mile runway at a cold and damp Bruntingthorpe Proving Ground was the location for MCN’s speed test – and the V4 didn’t disappoint here either. MCN speed tester Bruce Dunn used a 2D datalogging setup and hit the limiter in top gear, recording a GPS-verified 191.3mph. 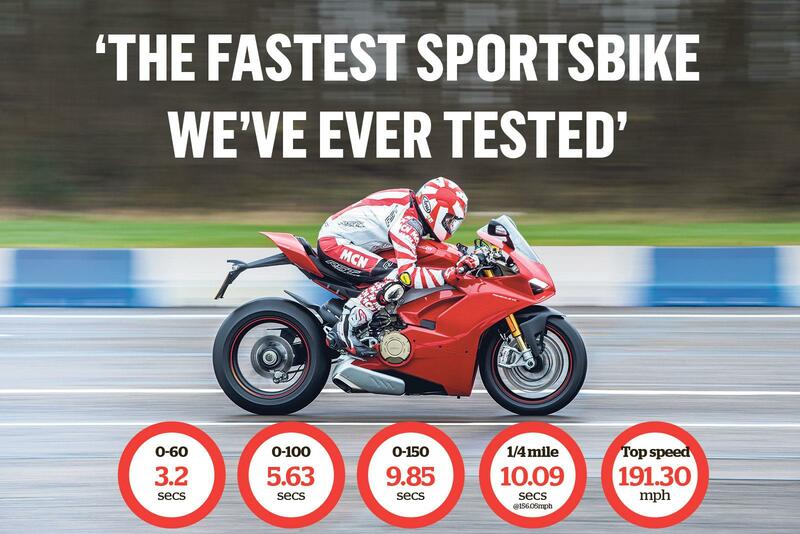 So that also makes the Panigale V4 S the fastest production sportsbike we’ve ever tested as well. Not only does this top speed indicate there is no speed restrictor within the Ducati’s electronics (the speedo stopped reading at 186mph as per the 1299), it also hints at more to come. 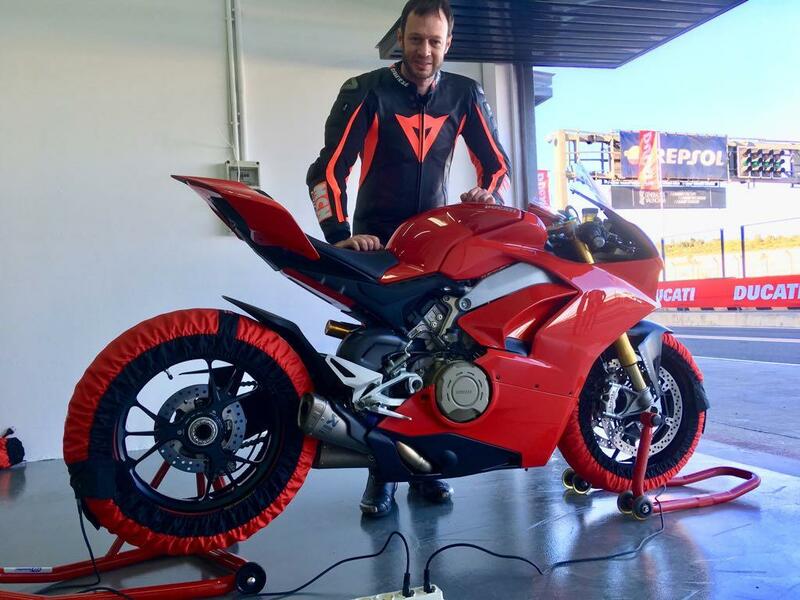 Bruce said the Panigale was still accelerating when the limiter chimed in, meaning it can certainly take higher gearing and therefore probably crack 200mph. "The V4 is astoundingly quick," Bruce said. "It accelerates so fast that you can’t feed it gears quickly enough - it just eats one up and instantly demands another. I’ve not ridden a production sportsbike that is so fast to accelerate. It’s also totally stable at speed, without a hint of weave, which is amazing. "You can feel the counter-rotating engine’s presence as the V4 is far less wheelie-prone than the V-twin, making it accelerate very quickly from a standing start once you get the clutch out." However, Bruce did add that the bike’s 0-60mph run was hampered by a grabby clutch – some things never change! 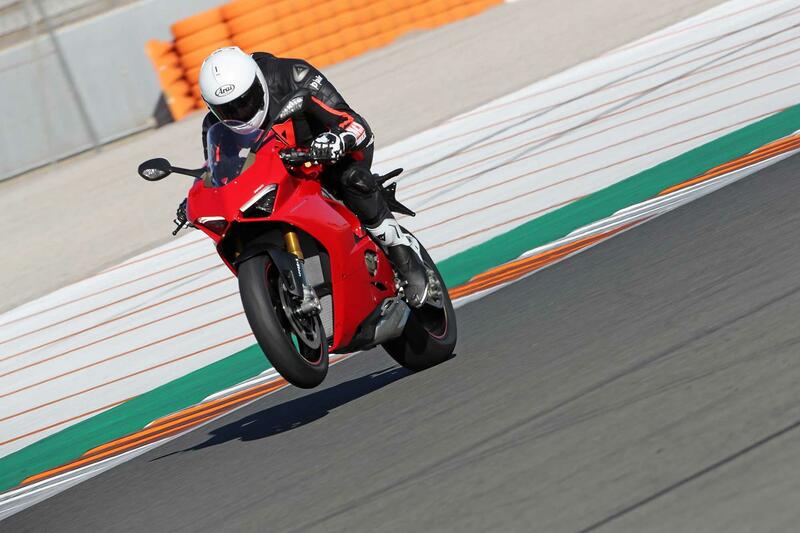 The Panigale V4 enjoys the second generation version of Öhlins semi-active EC suspension. Like having an invisible man with an invisible screwdriver constantly twiddling your adjusters, in theory it means the bike is perfectly set up in any scenario. It’ll soften itself off mid-corner in a 30mph hairpin but also provide the support needed though fast corners. The brakes redefine what you think is possible. There is so much power, so much feel through the new Brembo Styelma calipers as they bite on gigantic 330mm discs, that the limit is your own ability to brace yourself against the deceleration. As you move closer to the front brake’s capability your forearms shoulders start to suffer. The stability on the brakes is astounding, too – you just need to go to the gym to make the most of it. To minimise the inevitable weight gain from the extra bank of cylinders, Ducati developed an all-new frame, called the ‘Front Frame’. It's more compact and lighter than a perimeter frame and uses the engine as a stressed chassis element – keeping the kerb weight of the S and Speciale versions down to 195kg – 2.5kg lighter than the new 959 Corse. Compared to the monocoque design, the Front Frame allows torsional rigidity and lateral rigidity to be kept separate, to better absorb any road surface roughness when cornering. At just 4 kg, the Front Frame is secured directly to the upper half-crankcase of the front cylinder head and to the V4 rear cylinder head, with the engine also acting as a fixing point for the rear suspension and a fulcrum point for the single-sided swingarm. The Panigale V4 is equipped with a 43mm Showa Big Piston Fork (BPF), fully adjustable for preload, compression and rebound damping. The fork bodies house chrome sliders with Brembo radial caliper mountings. A Sachs steering damper completes the front-end package, while the rear gets a fully adjustable Sachs shock. 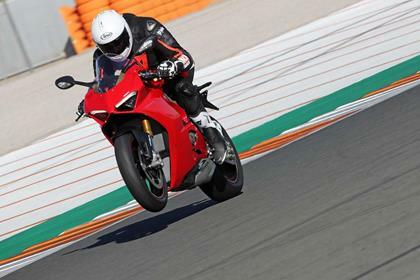 The Panigale V4 S and Panigale V4 Speciale are equipped with Öhlins NIX-30 forks, Öhlins TTX36 rear shock and Öhlins steering damper, with electronic semi-active control. 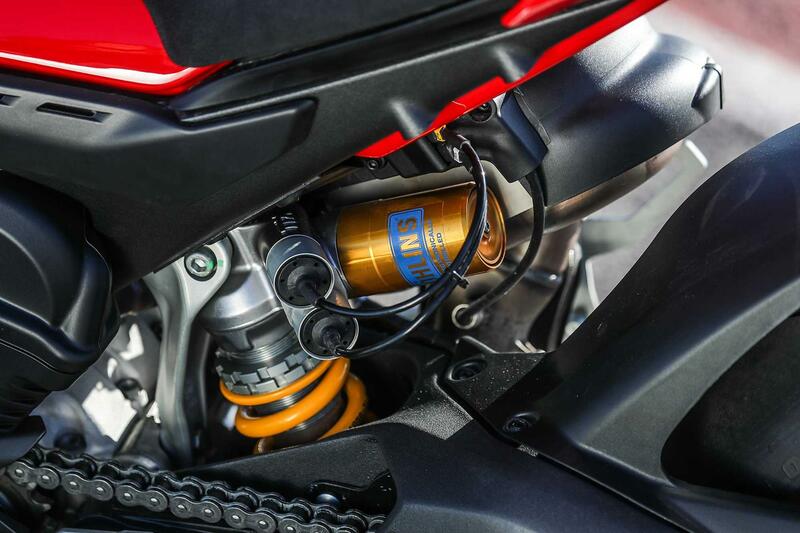 The suspension and steering damper are controlled by the second-generation control system, Öhlins Smart EC 2.0, featuring Ducati’s new Objective Based Tuning Interface (OBTi). The electronic suspension offers the choice between manual mode, allowing compression, rebound, and damping of the steering damper to be manually set via virtual clicks – or you can select the automatic semi-active 'Dynamic' mode. When Dynamic mode is selected, the system automatically adjusts compression and rebound damping in response to the rider's inputs and the road or track surface. 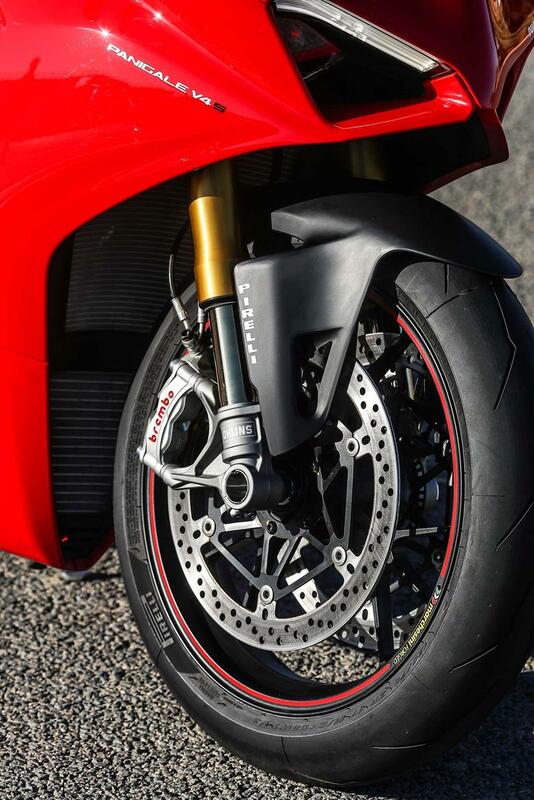 The new Panigale V4 range debuts Brembo’s new Stylema monobloc calipers - the latest evolution of the already high-performance M50. Machined from a single piece of alloy, they feature lighter-weight areas in the fixing bushings and in the body, making them 70g lighter each, without compromising on rigidity. 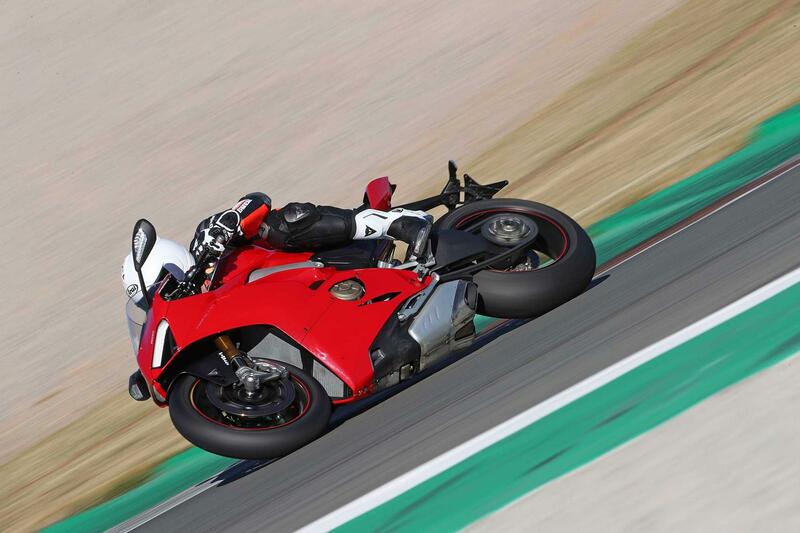 The same bore as Ducati’s V4 MotoGP motor and a longer stroke means a capacity of 1103cc and a claimed 211bhp, equating to around 198bhp at the rear wheel - it’s the most powerful naturally-aspirated production bike there has ever been. Midrange power is strong and as revs rise, this builds into a crescendo of noise, drama and almost-incomprehensible forward thrust. Things are kept a little calmer thanks to a counter-rotating crank, which runs in the opposite direction to the wheels, reduces the bike’s tendency to wheelies and aids the machine’s agility, too. 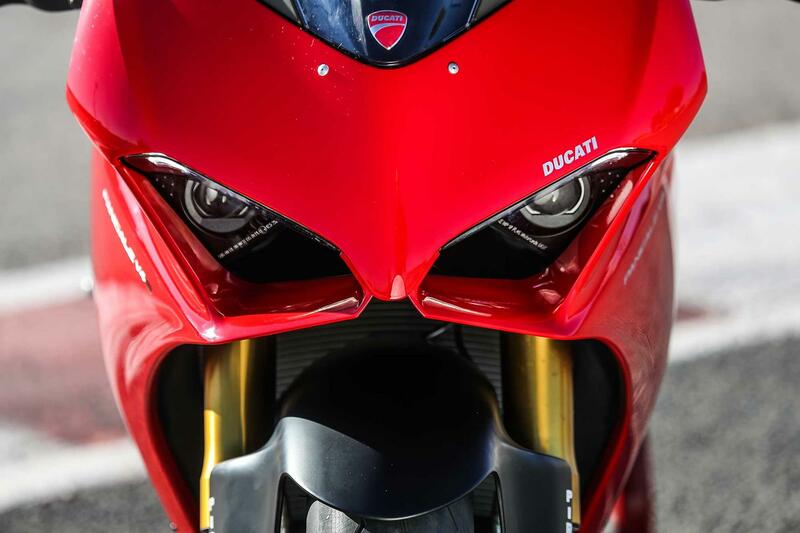 MCN sent the Panigale V4 S to BSD Performance, our regular dyno centre, to test out Ducati's power claims. This is the same dyno we evaluate all our bikes on to ensure the results are comparable. So how did it do? Drum roll please...The V4 S made a staggering 198.6bhp at the rear wheel, making it the most powerful mass-produced sportsbike MCN have ever tested. While impressive in itself, our test bike only had 600 miles on the clock. Once bedded-in, BSD boss Mark Brewin is certain the V4 will exceed the magic double-ton. Helped by its extra capacity, the V4 also makes a class-leading 87.4ftlb of torque. On the dyno this equates to a willingness to pull smoothly from as low as 4000rpm in the rev range, a point where the V-twin 1299 S judders. So despite giving away nearly 12ftlb of torque, and 182cc in capacity to the 1299, the V4 is smoother and faster to pick up revs. This is the first mass-produced Ducati bike to have a four-cylinder engine, and it’s derived directly from the MotoGP bike’s Desmosedici V4, but with a displacement of 1103cc. Developed in very close collaboration with Ducati Corse technicians and riders, it steals directly from the race bike in terms of design and architecture, but still manages to deliver impressive service intervals of 7500 miles, with the valve check only required every 15,000 miles. The 90° V4 uses the same 81mm bore as the GP bike with a longer stroke for improved low-to-mid rev torque, and boasts a counter rotating crank and twin-pulse ignition. And if that’s not enough, power can be boosted to ready high power of the standard Desmosedici Stradale configuration can be boosted to almost 220bhp with the optional titanium Akrapovic race exhaust. On almost all road bikes, the crankshaft turns in the same direction as the wheels. But as with MotoGP bikes, the new Panigale V4 gets a counter-rotating crankshaft. Its benefits are in gyroscopic effect and inertia, improving handling and directional agility. A counter-rotating crankshaft produces inertia-linked torque in the opposite direction, lowering the front of the bike, limiting the bike’s desire to wheelie, and therefore boosting acceleration performance. Similarly, during hard braking/deceleration the crankshaft itself also decelerates, producing an inertial torque that works to help to minimise rear wheel lift. The 90-degree V layout evens up first order forces naturally without having to resort to a balancing countershaft to eliminate vibration. The V is banked rearward 42°, just like the MotoGP engine, optimising weight distribution, allowing for larger radiators and bringing the swingarm pivot as far forward as possible. A combination of 70° crank pin offset and 90-degree V layout generates what Ducati calls a Twin Pulse firing order because it mimics the firing sequence of a twin-cylinder, with ignition happening at 0°, 90°, 290° and 380°. The Desmosedici Stradale engine takes in air through four oval throttle bodies (52mm diameter equivalent), connected to variable-height velocity stacks for the first time on a Ducati engine, and weighing in at 64.9kg, it is just 2.2kg heavier than the 1285cc Superquadro V-twin. As you’d expect with a bike over £20k, build quality is flawless. All the materials used are top-notch and the level of design, right down to tiny details like footrests and handlebar clamps, is class-leading. Paint is thick, panel gaps are perfect. This is a premium product. It’s too early to comment on the bike’s reliability, but the whole premise of going to a four-cylinder concept was to allow higher revs without compromising reliability. With the knowhow Ducati have gleaned from their V4 MotoGP concept it should deliver that dependability. This is never going to be cheap. Insurance costs are terrifying if you’re young (under 30 years old we'd say), live in an inner-city or have lots of points. But older, low-risk riders will be fine. Running costs are going to be high, but should be doable if you can afford the bike in the first place. Minor services are annual or every 7500 miles, while the dreaded Desmo service isn’t until 15,000 miles. 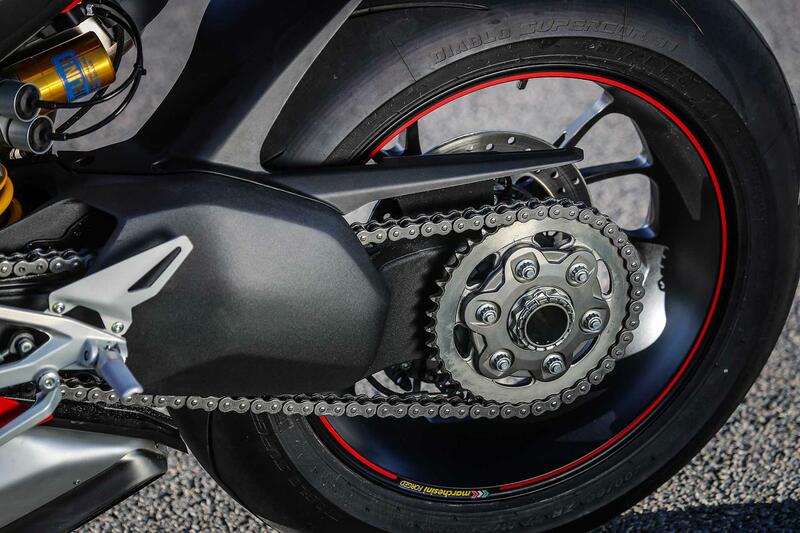 With chain-driven cams, there are no belts to change like on pre-Panigale V-twin Ducatis. Tyre costs will be high – with so much power you’ll kill a rear tyre in a single fast trackday and may fail to get more than 2000 miles from one on the road. A six-axis inertial measurement feeds data to the traction control, wheelie control, launch control, lean-sensitive quickshifter, semi-active suspension and cornering ABS. It has an amazing TFT dash, enough modes and settings to keep you amused for years, it even comes with GPS datalogging if you want. 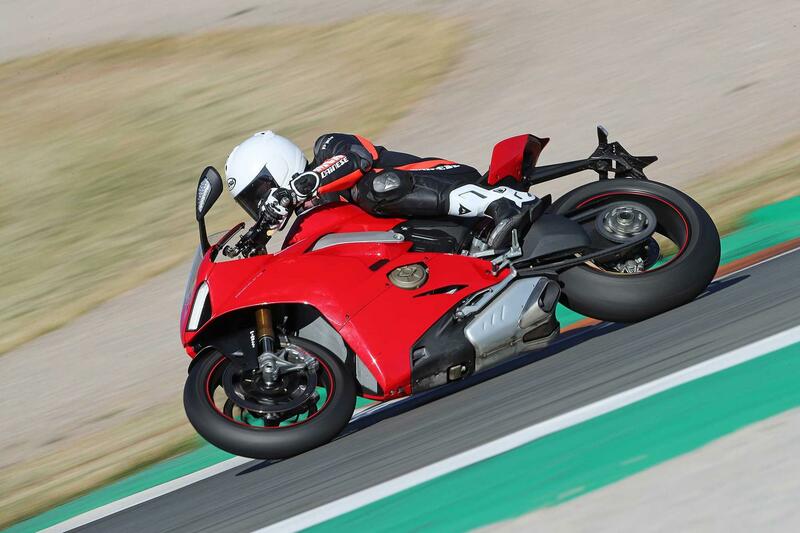 The Panigale V4 introduces controlled drift during braking, ABS Cornering on the front wheel only thanks to a set-up specially designed for track riding and a bi-directional shifter that even takes lean angles into account. 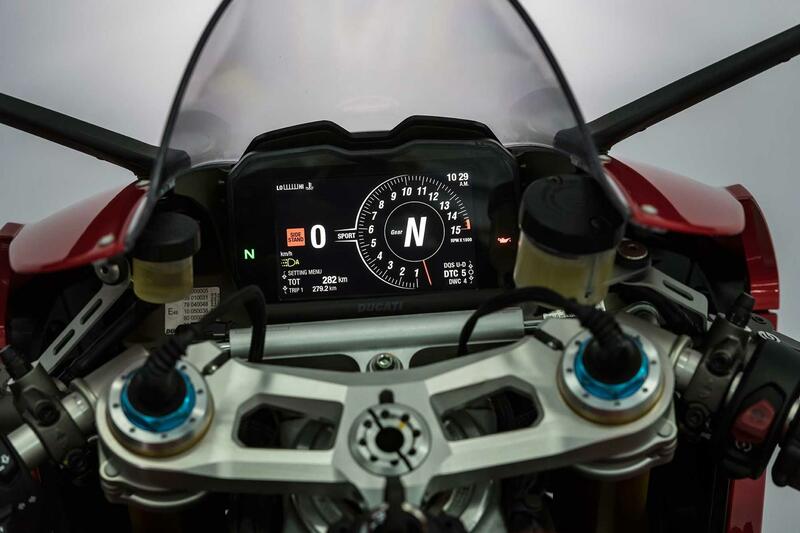 All these controls - developed on the track together with official Ducati riders and test riders - are incorporated in the three new Riding Modes (Race, Sport and Street) and can be adjusted via the advanced second-generation TFT dash. 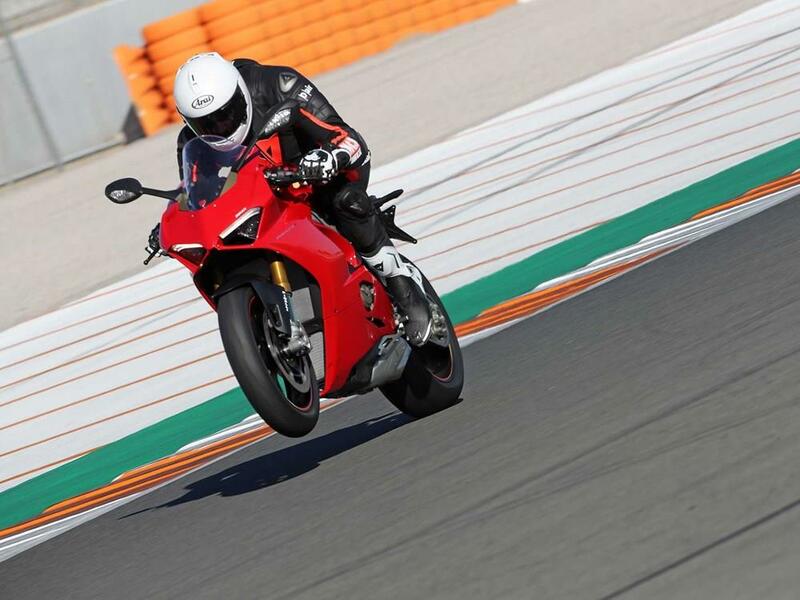 The introduction of the 6D IMU has allowed the Ducati Slide Control (DSC) - developed in conjunction with Ducati Corse - to be added to the Ducati Traction Control EVO (DTC EVO). This new system provides the rider with further support by controlling the torque delivered by the engine as a function of the slide angle, improving corner exit performance. Like the DTC EVO, the DSC controls torque reduction by acting on the throttle body valves, spark advance decrease and injection cuts. The DSC has two different settings: switching from level 1 to level 2 results in easier control of slide angles that would otherwise be difficult to handle for mere mortals. DSC intervention levels can be changed by accessing a special menu, in which DTC EVO and DWC EVO values can also be set. It is also possible to set direct DSC control via the direct access buttons on the left-hand switchgear, and the setting is always shown on the display. 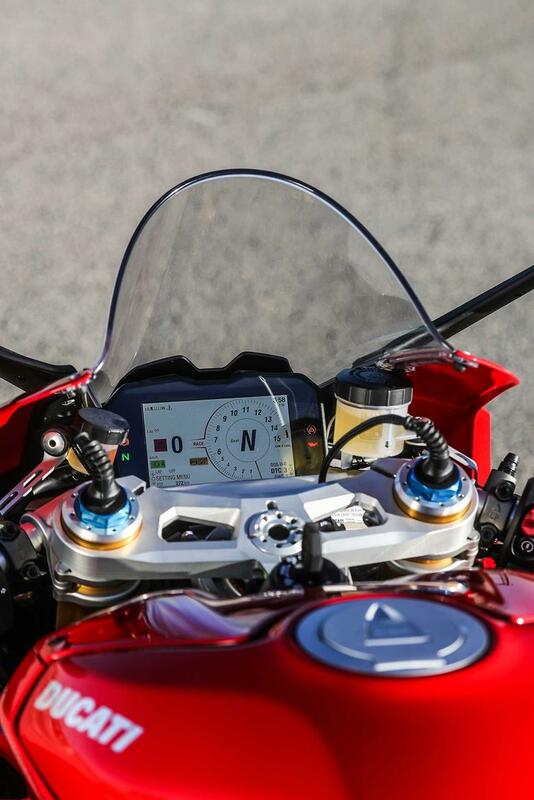 The Panigale V4 gets a new 5" full-TFT, high-res and high-brightness colour display, completely redesigned in terms of layout and graphics, including a new virtual circular rev-counter located on the right side. Two different layouts are available: Track mode focuses attention on the lap time indicator, while Road mode shows Ducati Multimedia System (DMS) information, and highlights engine rpm values typical of road riding. Top speed, selected riding mode, and selected gear do not change position when the layout mode is changed. 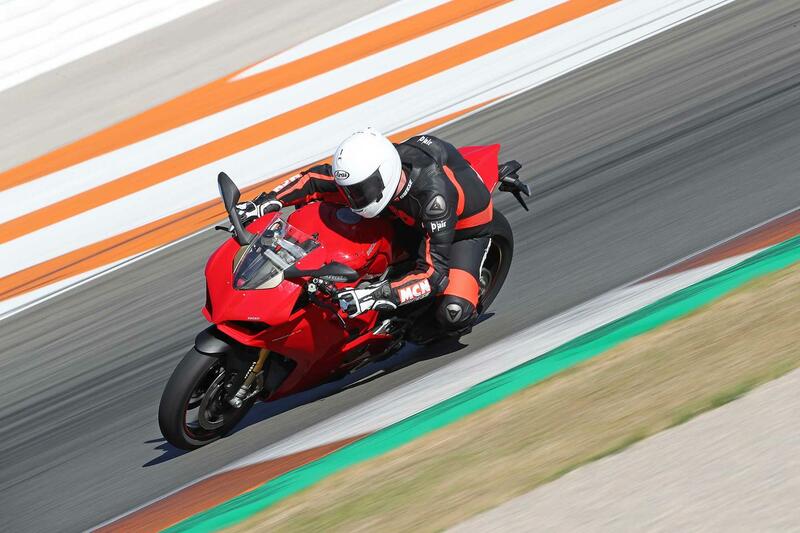 There are three different spec versions of the Ducati Panigale V4, here is how they compare. The prices were correct at the time each one was launched. 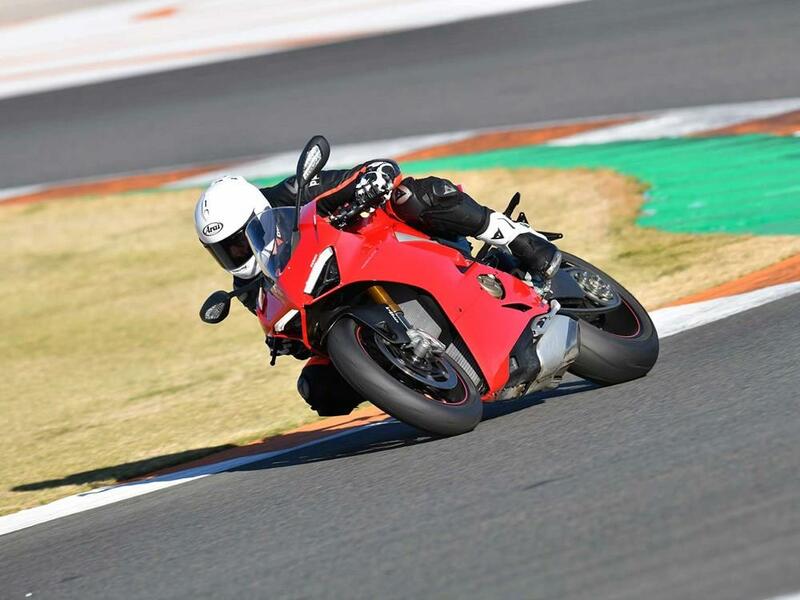 3 owners have reviewed their DUCATI PANIGALE V4S (2018-on) and rated it in a number of areas. Read what they have to say and what they like and dislike about the bike below. Overall, the bike is amazing. It just gets faster every ride, and it's so easy to ride. The only problem I've had is forgetting to use the trickle charger. The bike went flat over night but it was my fault. £250 for the 600 mile service ,make sure when buying to get this thrown in. The equipment on the bike is first class as you would expect. I was disappointed not to get the carbon front mudguard or Termis as with other S models. The dealer was great, always a pleasure to work with JHP Coventry Dave Rielly, he is an utter star. A properly set up V4 S is an absolute joy to ride. However, I have tried 3 now including the one I own, and the suspension preload has been different on them all. They all handled differently as a consequence. Only if the preload is right does the adaptive suspension do its job properly. The brakes are the best I have ever encountered, full of feel and immense power on track, and yet anything but scary on a wet slippery road. Awesome. The ability to switch between suspension modes whilst riding means the bike can handle the worst country roads one minute (without shaking your fillings out) and then is smooth on A roads the next. Never have liked steering dampers, switching this one to its minimum allows the front tyre to let you know every little thing it's doing. Once set-up right, even under extreme provocation it just shakes its head gently, nothing to worry about. A million times better than any other Ducati. Immense power, control, torque from low down and ability to deal with real-world traffic jams and low speeds. Some heat insulation between the engine and the seat would be good though. In dynamic mode the power delivery at high lean angles and low gears can be difficult to modulate which can upset the suspension. All 3 of the bikes I have tried have failed in some way. Water in the electronics on one, failed front wheel speed sensor cable on another, this resulted in a complete and total shut down of all the electronics including suspension and all rider aids, and no speedo. Serious engine faults on another. Quality of components is poor. Cheap plastic hugger and mudguard on a £25k bike is not right. Safety recall needed because of fuel leaks. About 6 other recalls to correct other issues. A recent software update forces the engine onto 2 cylinders at tick over to try and control excess heat. You don't buy a bike like this and complain about the running costs, but value is a different matter. As it comes from the factory there are too many bits that look cheap, presumably in an attempt to make you spend on the accessories list to make the bike look as it should at the asking price. Cynical and leaves a bad taste in the mouth. Cruise control and heated grips should both be on the V4. Evotec tail tidy fitted first time and is a vast improvement in looks. Tyres get eaten and Pirelli has the monopoly, so costs are high. One track day destroyed a new pair of Supercorsas! My Ducati dealer has been superb. Could not ask for a better experience. The whole package is fantastic . Very comfortable too . I ordered an Evotech tail tidy but after three attempts of sending them back (holes did not line up) got an NRC item instead . The engine sounds great as revs increase but not great at low revs. Just waiting for a good slip-on exhaust to be become available.